Since 1984, the National Insurance Crime Bureau (NICB) has published annual reports—known today as Hot Spots—that examine vehicle theft at the national and local level. NICB was originally established in 1912 as the Automobile Protective and Information Bureau and the company focused exclusively on recovering stolen motor vehicles that were insured by its 11 member insurance companies. Name changes and mission expansion over the years evolved into today’s NICB—with over 1,100 member insurance companies. Although recovering stolen vehicles remains a central function at NICB, our special agents, investigative assistants, intelligence analysts, trainers, government and public affairs personnel are equally focused on other pervasive fraud schemes, particularly within the medical and commercial environments. Watch a special edition video. Download a timeline infographic to learn more about NICB and how Hot Spots has evolved over the years. See an additional graphic here. NICB’s Hot Spots report examines vehicle theft data obtained from the National Crime Information Center (NCIC) for each of the nation’s metropolitan statistical areas (MSAs). MSAs are designated by the Office of Management and Budget (OMB) and often include areas much larger than the cities for which they are named. For example, the Bakersfield, Calif., MSA includes all thefts within the entire county of Kern, not just the city of Bakersfield. Moreover, as a population-based survey, an area with a much smaller population and a moderate number of thefts can–and often does–have a higher theft rate than an area with a much more significant vehicle theft problem and a larger population to absorb it. Although California tends to place high in this report, this is the first time that California has held nine of the top 10 spots for MSAs with the highest per capita vehicle theft rates. In 2012, it held eight and in 2011, seven. But there is good news nonetheless. 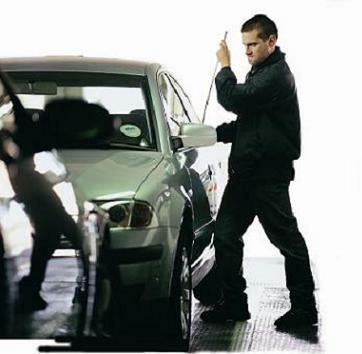 In 2012, a small increase in vehicle thefts ended a consecutive eight–year run of decreasing thefts. However, the 2013 NICB data shows thefts are once again on the decline. This is in line with preliminary 2013 FBI vehicle theft data– –released in February– –that shows a 3.2 percent decrease in vehicle thefts for the first half of 2013. If the preliminary FBI data holds when the final 2013 vehicle theft figures are released, then there is a good chance that the national total will be close to what it was back in 1967. About the National Insurance Crime Bureau: headquartered in Des Plaines, Ill., the NICB is the nation’s leading not–for–profit organization exclusively dedicated to preventing, detecting and defeating insurance fraud and vehicle theft through data analytics, investigations, training, legislative advocacy and public awareness. The NICB is supported by more than 1,100 property and casualty insurance companies and self–insured organizations. NICB member companies wrote $371 billion in insurance premiums in 2013, or more than 78 percent of the nation’s property/casualty insurance. That includes more than 93 percent ($168 billion) of the nation’s personal auto insurance. To learn more visit www.nicb.org.